Well today is Monday again here !!! 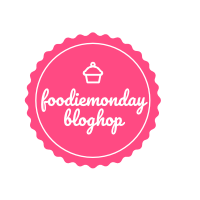 And the theme no 190th of the Foodie Monday Blog Hop foodie group is decided as 'Mini cakes' which is suggested by Preethi Prasad who blogs at Preethi's Cuisine. Mini cakes here we are focusing to bake small cakes which may either muffins, cupcakes or even mug-cakes. So here I have some muffins as 'Cardamom Rose Muffins'. For most of the Indian dishes we do add this wonderful ingredient, Cardamom. These are highly aromatic and the spice is immensely popular in Indian as well as middle-Asian cuisines. These pods are need to be ground just before using in the form of powder, otherwise the flavor and aroma of the cardamom get lost very quickly due to the rapid loss of the essential oils. If using in the form of seeds particularly in curries / stews even, then these can be directly added to the pot. Although I use this in curries as well as beverages (Cardamom Black Tea, Cold Brew Coffee with Cardamom flavor), but I didn't use in any baked dish particularly cakes. So here I have used the freshly ground cardamom seeds to make some muffins. During the whole baking procedure, my house is full of these beautiful aroma of cardamom. 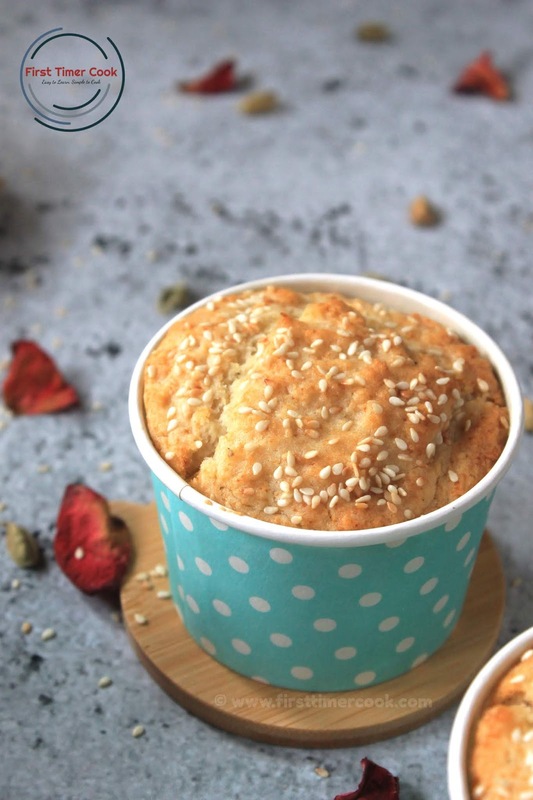 The muffins here are prepared with only whole wheat flour, keeping the healthy mode on. Also some rose flavor I have given to this baked sweet dish. Any age group, specifically kids'll surely devour these muffins. The slightly roasted sesame seeds on top of each muffin also add a nice crunch. but if you don't like then just skip this addition. The whole process is super easy and very quick. 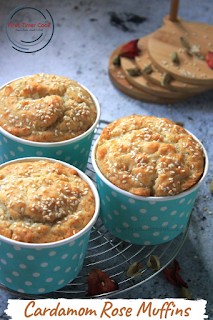 Just mix separately wet and dry ingredients, then finally mix both, scoop in muffin molds, bake and serve. Voila !! 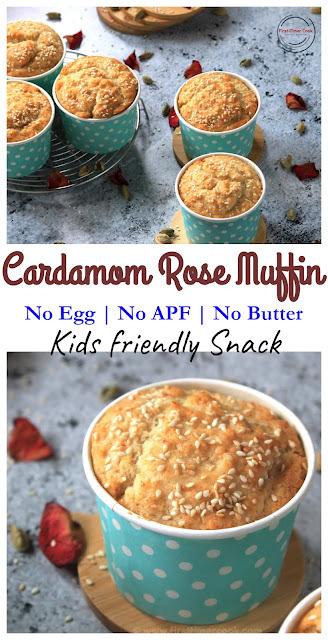 its that much simple 😉 So do try these egg-free, all purpose flour free and butter free Cardamom Rose Muffins soon. Preheat the oven to 180 deg C and line muffin tray with muffin cases. In a mixing bowl, take yogurt, powdered sugar, cardamom powder, olive oil, rose water and milk. Mix using a hand whisk till everything incorporated well. Then sieve the dry ingredients like wheat flour, baking powder, baking soda and salt. Add into the wet ingredient mixture and mix gently to get a smooth batter which will be neither thick nor thin. Spoon the batter to the muffin cases up to 3/4th portion of the cases. 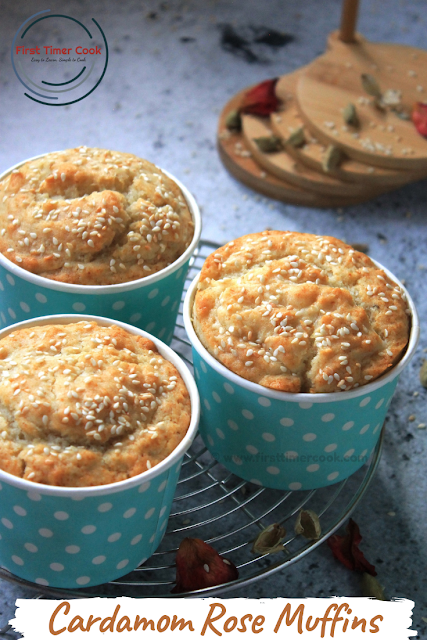 Sprinkle some roasted sesame seeds on each case and bake for 20-25 minutes or till a toothpick inserted into the muffins comes out clean. 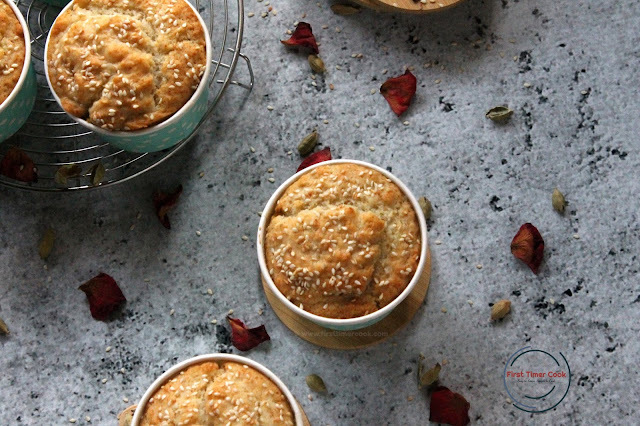 Sprinkling roasted sesame seeds on top of muffins surely gives a nice crunch. Still this addition is optional. I love cardamom flavors in my desserts and bakes. 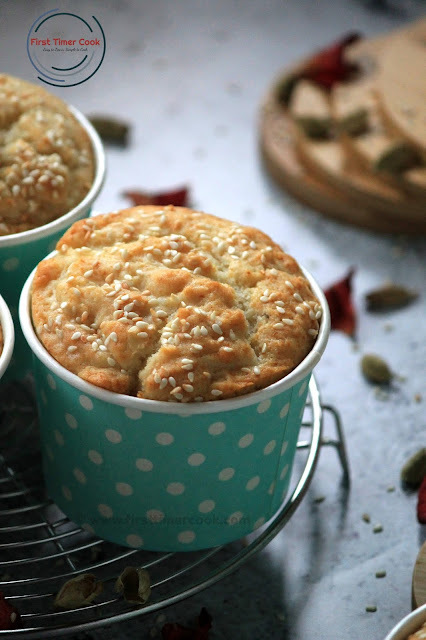 This whole wheat flour muffins sound guit free treat for kids and adults alike ! The recipe sounds so flavourful with cardamom these will go so well with a cup of tea for grown ups and hot milk for kids. I love the addition of sesame seeds on the top.Healthy, delicious and beautiful looking muffins.. 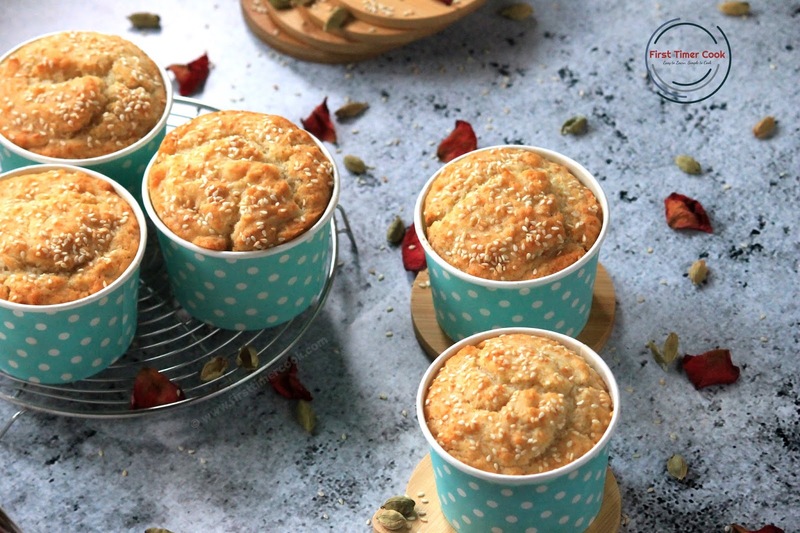 These muffins loaded with cardamom and rose looks fabulous and delish.Wheat flour muffins are healthy too.Fantastic share. 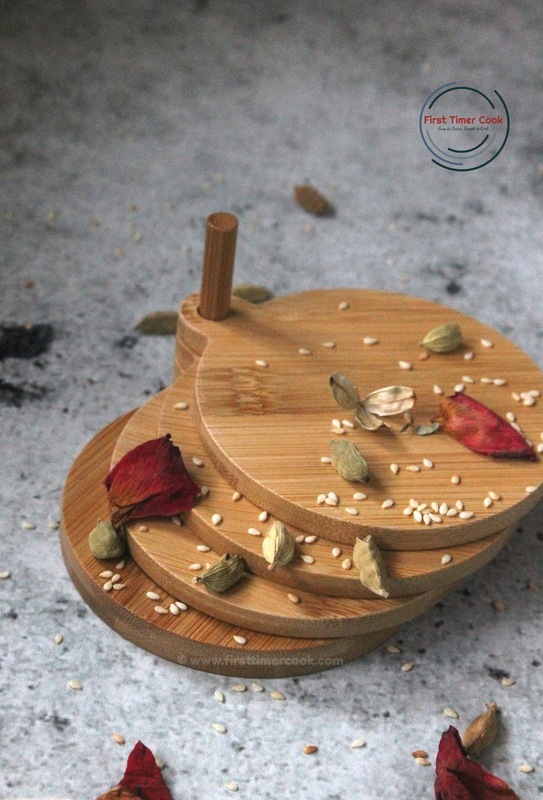 Sasmita I love the rose and cardamom combined flavors. They go so well with most bakes and drinks. Your muffins look so pretty and love the addition of sesame seeds on top.